Tuck Everlasting has long been the one book that has stood out so prominently out of the thousands of stories my mind has absorbed. What makes this small, seemingly simple story so memorable? What is it about the simplistic writing that has me mesmerized year after year as I reread these opening lines? Magic of a wordsmith that has withstood time and captured the essence of summer in this small, unassuming novel. It is set in the foothills of the Adirondack Mountains of New York, and includes a mysterious man in a yellow suit, a family with a deadly secret, and a girl named Winnie Foster who decides once and for all to step outside of the gate of her house. This is the children’s novel, even though it has never gotten the attention it deserved, and is a different story every time it is read. As you age, so does your understanding of this fantastic piece of literature. I will always have that little safe place in my heart for Jesse Tuck, as he will forever think of the girl who knew his secret and accepted him wholeheartedly. For in Winnie Foster, he found a reason to live. Tuck Everlasting was made into a motion picture film in 2002 by Disney. Visit Google Books for an online look at Tuck Everlasting by Natalie Babbitt. Thank you for commenting on my blog. 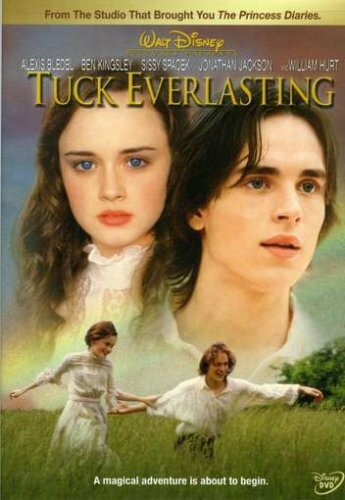 About “Tuck Everlasting”…I also wrote a review about this exceptional work of fiction on my Examiner page, where I write about literature in the form of book reviews, etc. The link to my book review on “Tuck Everlasting” is: http://www.examiner.com/x-34475-Fresno-Literature-Examiner~y2010m3d11-The-idea-of-immortality-is-debated-in-Tuck-Everlasting. I read the article—you are a great writer! Keep up the good work! Not actually related to the post at hand, but this is an official invitation to join my “Finding the ‘good’ parents in YA Lit” challenge and post your own list of books with “good” parents. Wow I’m literally the first reply to this awesome read?!? That’s right! And a good thing too! 🙂 Glad you stopped by. I’m rereading this book again right now.